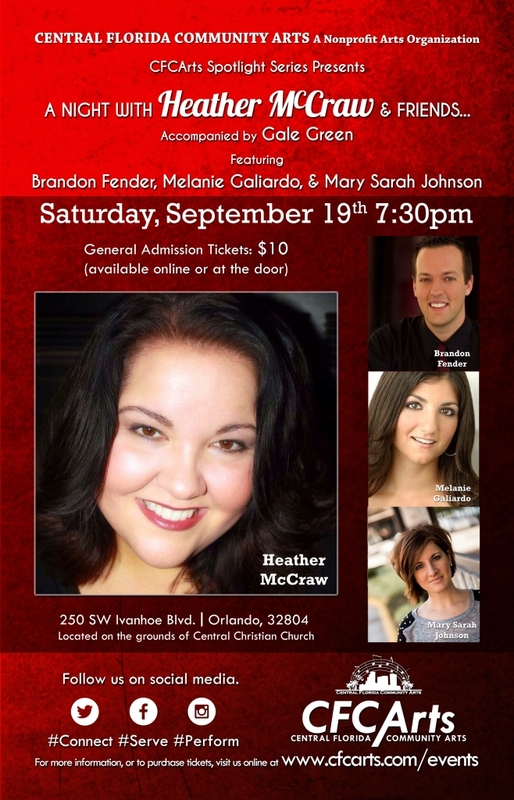 Scheduled for just one night only, A Night With Heather McCraw and Friends will take place on Saturday, September 19 at 7:30pm at CFCArts’ Central Campus, which is housed on the grounds of Central Christian Church, 250 SW Ivanhoe Blvd., Orlando, 32804. Please park behind the church, going around the left side of the building, and taking care to not use the I-4 entry ramp, which is next to the church’s driveway. Guaranteed seating can be purchased in advance for $10 (credit card/Paypal) or, if available, at the door (cash/check). Doors open 30 minutes before showtime, wheelchair accessible seating is available, and all seating is general admission.